Foliage: alternately arranged and clustered at the ends of the branches. They may be bluntly toothed or not. The upper and lower surfaces are covered with yellow circular glands that are visible under a hand-lens. Flowering time: early May to early June, before or with the leaves; fruits early August into September, persisting over winter..
Habitat: moist or wet ground of marshes, sand flats and pinelands, maritime forests, adjacent to salt marshes. Range in New Jersey: Rare on coast strip and Delaware Bay Shore but locally common in Cape May county. Misc. Morella cerifera reaches its northernmost limit in New Jersey. M. cerifera hybridizes with M. pensylvanica. There are both female and male plants. 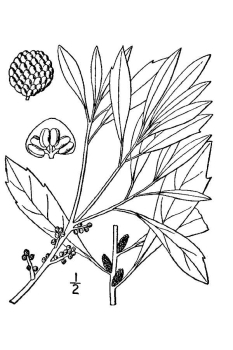 The root bark and leaves were used medicinally (Hough, 240). Crushed leaves were rubbed on the skin to repel mosquitos and boughs were placed under beds to repel fleas. The fruits are a food source for birds, including migratory warblers. In fact, the Myrtle Warbler was named for its wintering association with M. cerifera. 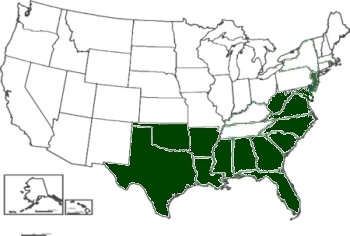 It is semi-evergreen to evergreen in warmer areas of the country.